If you enjoy orchid artwork, just click on this link! 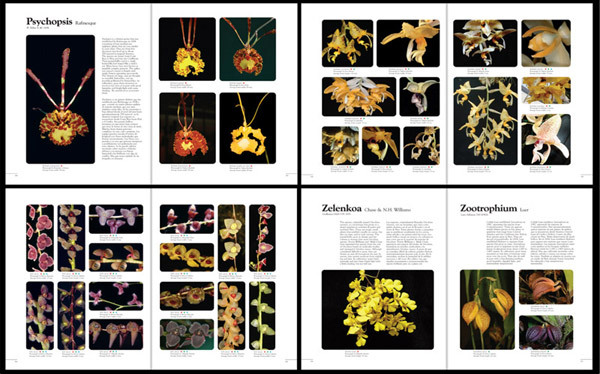 Many of these rare orchid books contain photos not available on the Internet. Some Dell laptop deals offer displays which show these photos in high definition quality. We are offering a large, more than 450 book, orchid library, including microfiche and color slides. 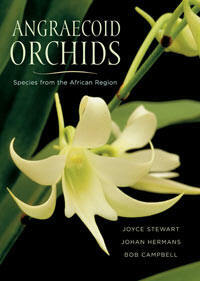 This collection includes many rare books as well as most orchid floras from around the world, biology, taxonomy, etc. If you are interested, please email Pam or call us at +1 217-355-9331. Prices below are not up to date due to the ever changing currency exchange rates. For a partial listing of these titles, click on this link! Native Ecuadorian Orchids. Cal Dodson. volumes 1-5 (will have 15 volumes when complete). $500 for volumes 1-5. Volume 1 : AA-Dracula. 200 pp. 370 illustrations. Volume 2 : Dresslerella-Lepanthes. 200 pp. 480 illustrations. Volume 3 : Lepanthes-Oliveriana. 230 pp. 590 illustrations. Native Ecuadorian Orchids Volume 4 : Oncidium-Restrepiopsis. 230 pp. 580 illustrations. Volume 5 : Rodriguezia-Zygosepalum. 300 pp. 536 illustrations. This CD-ROM, the fifth volume in the series Flora Malesiana: Orchids of New Guinea, treats 46 genera (Pachystoma to Zeuxine) with 478 species and varieties. Among the major genera are Peristylus, Phreatia, Plocoglottis, Spathoglottis, Taeniophyllum and Trichotosia. Genera of horticultural importance include Paphiopedilum, Phalaenopsis, Renanthera, Spathoglottis and Vanda. For every species a full description is given, with data on distribution (including maps in full color), synonymy, cultivation, ecology, typification, classification, references, etc. An impressive collection of color photographs and drawings, both published and unpublished, complements the texts. 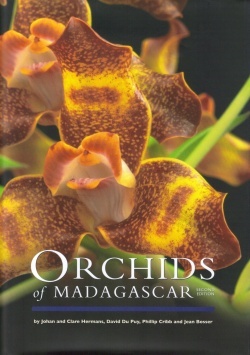 Several leading botanical institutes, such as the Royal Botanic Gardens, Kew, the Royal Botanic Gardens, Edinburgh, the Herbarium Bogoriense, Bogor, and the National Capital Botanic Garden, Port Moresby, as well as many well-known photographers have contributed to make this highly praised CD-ROM series a must for all who are interested in the orchids of New Guinea and Southeast Asia. Available: Windows 98/Me/XP/Vista; Mac OS 8.6-9.x or Mac OS X 10.1 or higher. Other CDROMs from ETI: approximately $90.00, varies with exchange rate. The Genus Cymbidium. David Du Puy & Phillip Cribb. Due January 2008. Cymbidiums are among the most important and popular orchids in horticulture. Starting in late Victorian England, the variety of form and colour in the species encouraged hybridisation that has provided a great diversity of novelties for the nursery trade over the years. They are versatile plants, marketed as cut-flowers, buttonholes and as pot plants, producing many large, long-lasting flowers. Cymbidium growing in the Far East can be traced back to the time of Confucius (about 500 BC), but the first species were only introduced to Europe and China at the end of the 18th century. Relatively few species were seen in cultivation in Britain until the time of the Industrial Revolution, which provided both the leisure time and the money for an explosion of interest in orchid growing. From the mid-19th century onwards, extensive exploration and collection of new species took place. The genus Cymbidium currently comprises some 52 species distributed throughout south and east Asia, the Malay Archipelago and north and east Australia. Orchids of Madagascar. 2nd Edition. Johan and Clare Hermans, David Du Puy, Philip Cribb and Jean Bosser. 2007. Vol. 1 Orchidaceae Belgicae (1983) 40 cm., 12 plates full color reproductions of water paintings"
Vol. 2 Orchidaceae Belgicae (1984) 40 cm., 12 plates full color reproductions of water paintings"
Vol. 3 Orchidaceae Belgicae (1985) 40 cm., 12 plates full color reproductions of water paintings"
Vol. 4 Orchidaceae Belgicae (1986) 40 cm., 12 plates full color reproductions of water paintings"
Vol. 5 Orchidaceae Belgicae (1987) 40 cm., 12 plates full color reproductions of water paintings"
Moth Orchids. The Complete Guide to Phalaenopsis. By Steven A. Frowine. due September 2008. With their refined beauty and elegant flower form, moth orchids (members of the genus Phalaenopsis) are often referred to as the basic black of the orchid world. In fact, moth orchids are the most popular orchids in the world, accounting for a staggering 75 percent of all orchid plant sales. More than merely beautiful, they are also among the easiest orchids to grow, whether in greenhouses, on windowsills, or under artificial lights, and the individual flowers can last for up to three months in pristine form. These appealing traits make moth orchids the first choice of every orchid fancier, from rank beginners to dyed-in-the-wool fanatics. Most flower lovers are familiar with the elegant white, pink, and striped hybrids, but a revolution in phalaenopsis breeding has resulted in an entirely new, diverse, and wonderful array of flower colors and patterns previously unimaginable. Professional horticulturist and orchid expert Steven A. Frowine, author of Miniature Orchids (Timber Press, 2007), focuses on these new stars while also providing a detailed look at the classic hybrids and species. Readers will be enticed by the book's 365 lavish color photographs and gratified by the wealth of practical advice on selecting and buying moth orchids. Most importantly, Frowine shares his secrets on how these glorious plants can be grown to perfection, with recommendations about light levels, potting media, watering, and feeding. 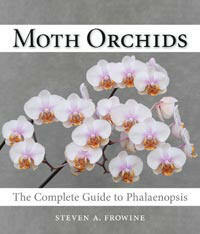 Especially useful are his clearly illustrated step-by-step directions on how to repot, trim, and propagate moth orchids. If you're a novice orchid lover, this book will arm you with all the knowledge you need to enjoy moth orchids' magnificent blossoms in your home. If you're a phalaenopsis fanatic, you'll be thrilled to see just how exciting the world of moth orchids has become. 204 pp. hardcover. 328 color photos. $39.95.
. due November 2008. Revered by avid orchid collectors for its delightful, star-shaped flowers, Huntleya is a small group of orchids found low in the forest. Besides their striking colors — from deep blue to waxy red, royal purple to almost black — flowers of this group are known for their distinctive shapes, patterns, and textures. As appealing as these lovely tropical orchids are, their identification has been confused since the first species was described in the mid-1800s. Recent DNA studies have led to a clearer understanding of relationships and, as a result of this clarity, it is now possible to sort out the taxonomic problems and identify the characteristics that set species apart. 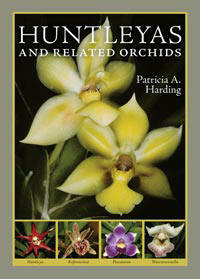 In this first book devoted to the Huntleya alliance, author Patricia Harding presents evidence from the scientific literature, other growers, and her own experience that will enable orchidists everywhere to identify their plants and grow them successfully. Angraecoid Orchids. Species from the African Region. By Joyce Stewart, Johan Hermans, and Bob Campbell. These so-called 'jewels of Africa' with their sparkling flowers, distinctive growth habit and floriferous nature are much prized and this account, the first to include the angraecoid orchids of both Africa and Madagascar, is long awaited. 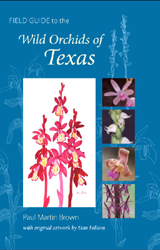 It brings together, in a single volume, descriptions of all 690 species in this intriguing group of orchids and will be the essential reference for all angraecoid orchid enthusiasts for years to come. Stewart, Herman and Campbell have all spent time in various parts of eastern and southern Africa and precise ecological information relating to habitat, altitude preferences and flowering season of individual plants will be particularly helpful to growers. The diagnostic features of each genus are illustrated and over half the species are accompanied by exquisite photographs taken in both wild habitats and in cultivation. The Marie Selby Botanical Gardens Illustrated Dictionary of Orchid Genera. Peggy Alrich and Wesley Higgins. 2008. ISBN: 978-0-8014-4737-2. 512 pp., full-color illustrations throughout. 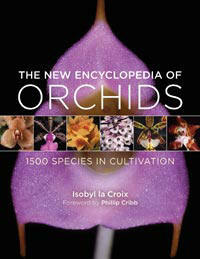 $49.95 This is the most comprehensive and extensively illustrated account of orchid genera to date. Its concise entries provide details of nomenclature, classification, original publication, etymology, and geographic range, along with a brief description and color images of representative flowers. The dictionary describes not only all of the 850 orchid genera that are recognized today but also those genera known only from fossil records, published before Linnaeus, validly published (but not accepted), and invalidly published according to the standards of the International Code of Botanical Nomenclature, as well as those that have variant names or spellings. In addition to the alphabetic entries, this dictionary includes an introduction to orchid biology, a glossary, a list of taxonomists credited with publishing new orchid genera, key references and bibliographical abbreviation list, and the governing nomenclature rules. The Marie Selby Botanical Gardens Illustrated Dictionary of Orchid Genera also features a Foreword by Peter H. Raven and an Introduction on the biology of orchids by David Benzing that describes the August 2007 discovery of the world's oldest unequivically orchidaceous fossil. 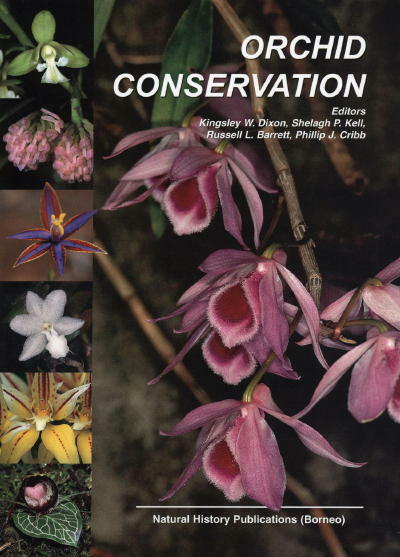 Orchid Biology: Reviews and Perspectives X. Kull, Tiiu; Arditti, Joseph; Wong, Sek Man (Eds.). 2008. ISBN: 978-1-4020-8801-8. Approx. 500 pp. Hardcover. $339.00 approx. This is the 10th volume in a series which was initiated in 1977. Like previous volumes, it contains scientific peer reviewed reviews on topics dealing with orchids. These topics include 1) a history of orchid breeders in Singapore, 2) discussion of research on pollen effects on orchid flowers carried out a century ago by the German plant physiologist Hans Fitting in Bogor, Indonesia which led to the first suggestion that plants produce hormones, 3) consideration whether orchids are mentioned in the Bible, 4) review of food hairs in orchids, 5) outline of pollen dispersal units in orchids, 6) survey of orchids in art, 7) a tracing of the history of Vanilla pollination, 8) a chapter on viruses which attack orchids and 9) an appendix which lists a very large number of orchid books. Indian publications. Warning: do not buy these books if you tend to be picky about the way books look. The printing is below standard and is only useful if you HAVE to have one of these. There are no returns. Contents: Preface. 1. Introduction. 2. History. 3. Importance and uses. 4. Distribution. 5. Evolution. 6. Botanical classifications of Orchid family. 7. Naming an orchid. 8. Classification based on plant structure and habitat. 9. Basic structures of orchid plants. 10. Basics of orchid growing. 11. Housing of orchids. 12. Propagation. 13. Pollination. 14. Breeding. 15. Growing orchids from seeds. 16. Clonal propagation through tissue culture. 17. Post-harvest management of cut flowers. 18. Diseases and pests and their management. 19. Orchid genera, species and hybrids. References. Annexes: i. Books on orchids. ii. Orchid journals. iii. Orchid societies. Index. Orchids are primarily valued for their beautiful and intriguing flowers. In the global market cut flowers and potted flowering plants of orchids occupy a very important place. Moreover, the international trade on these crops are advancing very steadily and search for newer materials are rising irresistibly. Orchids also play many beneficial roles in human life as medicine, phytochemicals, spice, flavouring agent and food. Interest on orchids has increased manifold over the years and marked accomplishments have been made through scientific research and investigations. To stimulate the development of an enquiring mind, this book is organized in 19 comprehensive chapters to review, streamline and highlight the achievements on orchids. 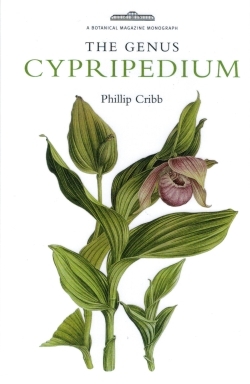 It provides a wealth of fascinating information on 110 important and interesting genera, 400 species and many hybrids of orchids. This book also furnished extensive review chapters on history, evolution, classification, propagation, pollination, breeding, agrotechnology, green houses, in-vitro seed culture, tissue culture, post-harvest technology and plant protection. This publication is intended to be comprehensive source of information to amateur and professional growers, exporters, orchid industries, horticulturists and also concerned students, teachers and researchers. Orchid Genera in Thailand II. Cleisostoma Bl. Orchid Genera in Thailand III. Coelogyne Lindl. Contents: Introduction. General remarks, key to genera. List of genera and species: 1. Erythrodes. 2. Herpysma. 3. Dicerostylis. 4. Goodyera. 5. Ludisia. 6. Vrydagzynea. 7. Cystorchis. 8. Anoectochilus. 9. Evrardia. 10. Cheirostylis. 11. Myrmechis. 12. Zeuxine. 13. Hetaeria. 14. Spiranthes. 15. Cryptostylis. 16. Tropidia. 17. Corymborkis. 18. Epipactis. 19. Aphyllorchis. 20. Thaia. 21. Lecanorchis. 22. Galeola. 23. Vanilla. 24. Nervilia. 25. Epipogium. 26. Stereosandra. 27. Didymoplexiella. 28. Didymoplexis. 29. Gastrodia. 30. Bletilla. 31. Summary. 32. Literature. Index. Contents: Preface. 1. Introduction. 2. History. 3. Ecology. 4. Morphology. 5. Evolution. 6. Flowering. 7. Systematics. 8. Specialized groups. 9. Enumeration. 10. Conservation. 11. Glossary. Literature cited. Index. This book aims at providing the readers a brief picture of the orchid wealth of India. The geographical regions, diverse habitats and the distribution of orchids in India, both region-wise and altitude-wise, have been provided under ecology. The life form, growth habit and morphology of the Indian orchids have been discussed under morphology. A large number of figures of the habit, inflorescence, flower, lip, column, stigma and rostellum, anther and pollinia have been provided to show the extreme ranges of diversity in the vegetative and floral forms of orchids. The flowering behaviour, flowering period and the phenology have also been discussed. Systematics describes the orchid family, key to various subfamilies, and classification of the genera and their tribes and subtribes. An artificial key to the 185 Indian genera, followed by the brief generic description, has been included, too. Orchids with speciality, like having two fertile anthers; with climbing habits; and saprophytic habits, have been discussed separately. A new species under a new genus, and three new combinations have been described. As orchids in the wild today are subjected to various threats, measures for their conservation have been discussed separately. The enumeration lists 1331 taxa recorded till today in India, showing their regions of occurrence and their flowering periods. A glossary of the botanic terms used in this book has been provided at the end. Numbers 1 and 2 of volume 26 of the Fieldiana: Botany scientific revue (1952-53). Prices may fluctuate with the Currency Exchange Rate!